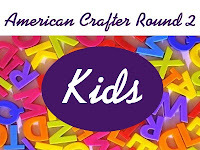 It's time for Round 2 of American Crafters and this week is all about kids. Good thing I got me one of those! After you're done here, head to the competition and page and pick out your fav! Every day my one-year-old daughter becomes more of a toddler and less of a baby and with that, comes her personal quest for independence. I knew she'd love to have her very own, big-girl chair and when I saw an unfinished, pint-size chair for just $7, I knew it was meant for her! I painted it, distressed it, aged it...and, then I added a simple bird shape and her name using fun, Amy Butler scrapbook paper. Of course, she had to have a bird-shaped throw pillow to go with her new chair, so I made one (my second sewing project since high school home ec!) 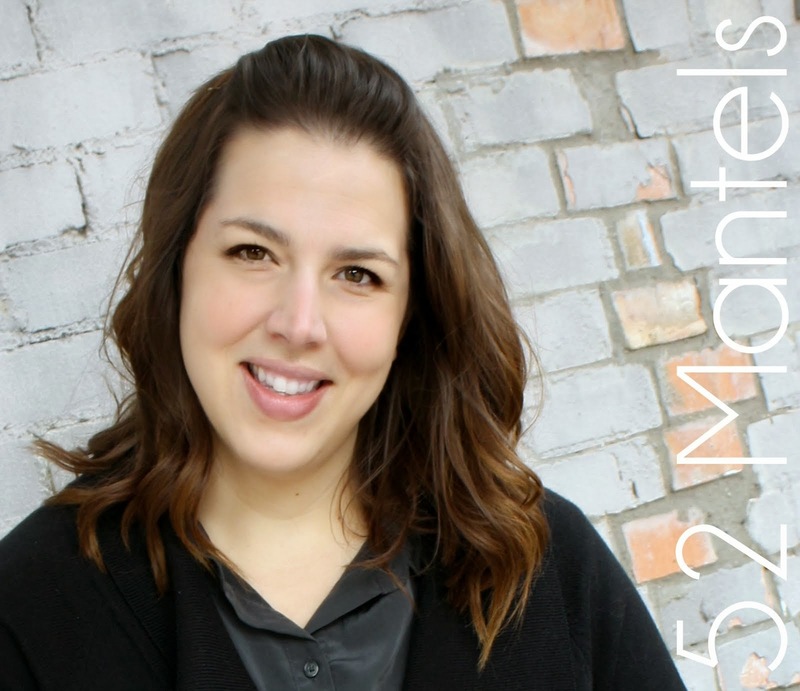 using her outgrown baby jammies and a sweet swaddle blanket (sentimental momma, right here!). I'm not really giving you a full tutorial for this bird pillow because, seriously, I'm a total novice when it comes to sewing. I did take home ec in high school, but that was about 13 years ago. I've recently taken up sewing and this is my second project. But, I'll give you the highlights and maybe you can muddle through like I did! I used the bird shape from the chair as a guide and started sketching bird shapes onto freezer paper until I'd found a shape I was happy with. I cut two birds from the paper and then worked on the belly. When I'd found a shape for the belly that worked, I free-handed a wing shape onto paper and that gave me all the pieces to my bird pattern. I have no idea how to share this pattern with you guys. Any ideas?? If you really want it, let me know and I'll see what I can do. I wanted the pillow to be soft and cuddly, so I used an outgrown pair of fleece pajamas and a soft receiving blanket from my daughter's newborn days. The rest of the bird is cut from various fabric scraps. For the wings, I ironed on each layer before I hand-stitched them, using turquoise embroidery thread. After each layer was cut and the wings were attached, I sewed all the pieces together, inside out, leaving a gap in one of the bottom seams to add poly-fil. Before sewing on the bird's belly, I sewed in a ribbon tail by tucking my halved ribbon pieces into the body. After my tail was in place, I sewed the bird closed, leaving an opening to fill. To finish the bird, I turned it right-side out, sewed in two button eyes, stuffed with poly-fil and hand-stitched the opening. The chair started out as a plain-jane, unfinished piece. I gave it a good sanding and filled the nail holes with putty. I then gave the chair a quick coat of light turquoise paint. When that was dry, I dry-brushed on a thin coat of dark turquoise paint. When that coat was dry, I sanded the entire chair and then, using paper towels, wiped on dark walnut wood stain. I cut my letters and the bird shape from scrapbook paper and then mod podged the pieces into place. Using brown acrylic paint, I hand-scripted a single line of lyric over the bird. And, to seal everything and keep the mod podge pieces in place, I finished the piece with a coat of matte polyurethane. My daughter is a big fan of both the chair and the bird. A success, in my book! Now, it's time for you to go vote in Round 2 of American Crafter!! The competition is tough. I could use all the help you can give me. Your project is precious, but the PICTURE you captured of your baby girl squeezing the birdie pillow--absolutely adorable! Melt my heart! You always get my vote! Yep, your chair totally ROCKS. I'll be sending people over to vote for you later today when I get around to blogging. Your project is great! I am not sure which is cuter, the chair or you daughter! 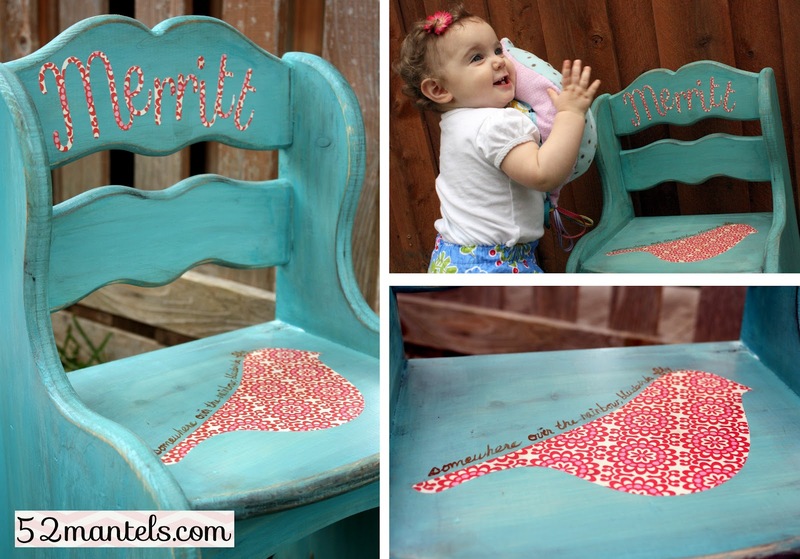 A little princess chair for a princess! 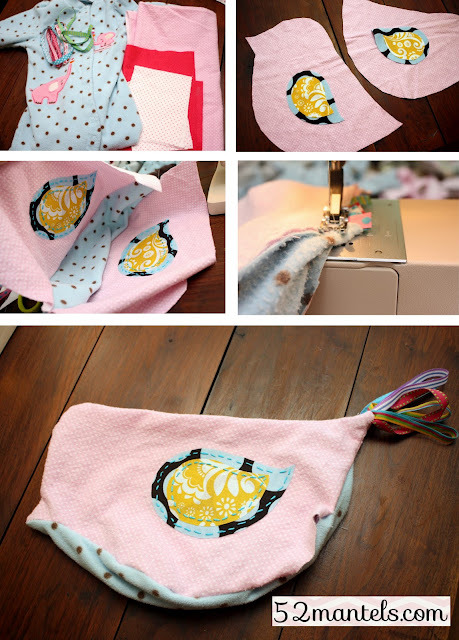 What an adorable project for such an adorable little girl! That is such an adorable project! I love the pillow! I absolutely LOVE your chair and pillow! 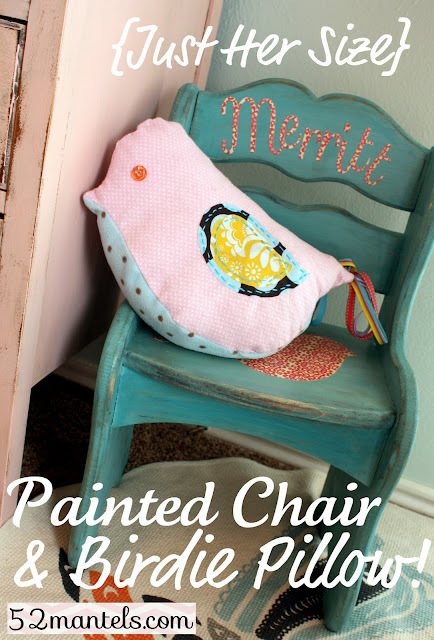 I love the colors and love how you used fabric on the chair!!! Love it! Oh my gosh! I LOVE LOVE LOVE this!! They're both so cute! I'm totally pinning this and voting! Great job! Emily!!! AH-MAZING once again! I totally need to make one of these for Anna... she would love it :) I hope we both make it to next week... but I'm also thinking I need to get some sleep :) Voted for ya! Too sweet! New follower on your Linky! Emily, this is adorable. 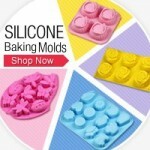 Perfect for a little girl. Okay, I just have to say it.... So TWEET! Cute birdie pillow! Love it. I can tell that your precious little one does too! You are so TALENTED!!!! LOVE IT!!!!!!!!! SO freaking cute! I love that pattern/color with the turquoise. Totally going to have to copy cat! Stopping by from the blog hop. I'm a new follower! that bird pillow is adorable!! visiting from the sunday social! you have such great projects!! Adorable! She is such a cutie with her new little bird pillow & chair! Ok.....so my grandbaby is stinking cute! bringing my umbrella stroller on Thursday. Can you help me remember? Super cute...the chair and the little girl! Great job! Found you at the Turquoise Lovin Party. A two for one post...love it. Both are so adorable BUT that bird stuffie is beyond precious. 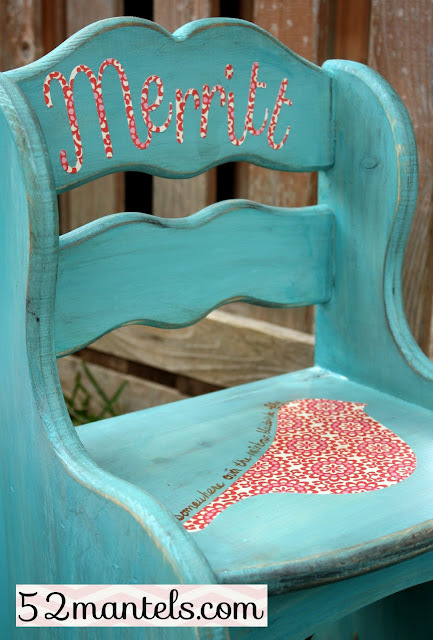 That is the SWEETEST chair ever!! I Love it! So stinkin cute!! Thanks for sharing this as well at Thursday's Temptation. Love this Chair! Where did you get it for $7?! Thanks so much! I bought it in Canton, Texas at a monthly event called Trade Days. It was from an unfinished wood shop. Their prices are incredible!